Chadwick Arboretum has been selected as the permanent location of the 2011 Energy-Efficient, enCORE Solar Decathlon House that was designed and installed by Ohio State students. What is an enCORE House? Since 2002, the U.S. Department of Energy (DOE) and National Renewable Energy Laboratories (NREL) has sponsored the university student-led Solar Decathlon. 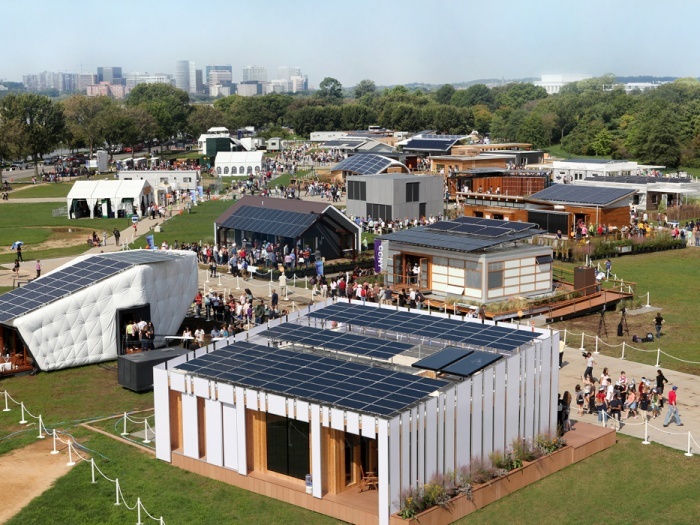 The competition takes place every two years on the National Mall in Washington DC, where 20 teams from around the world build and showcase their innovative designs for 21st century, sustainable homes. The houses are judged in 10 categories relating to design, performance, energy efficiency, and market viability. Thoughtful designs provide houses that are affordable, efficient, and appealing. The houses use both active and passive strategies to utilize renewable resources to their advantage with the ultimate goal being net-zero energy consumption. The competition is a chance for students to showcase innovative designs and ideas in a way that will help educate the world on the importance of sustainable design. The enCORE house finished fifth in the 2011 competition, which included 19 total entries from the United States and abroad. More than 70 students from 13 different majors were involved in our project. The Ohio State enCORE is an 800+ square foot home designed to house a three-person family. It features two bedrooms, a den, and a fully functioning kitchen and laundry. The focus on a family home drives the design, from material choices to flexibility of spaces. These programmed spaces are layered around the mechanical core, which allows light and ventilation to pass through the entire home. To further minimize the home’s environmental impact, the design combines passive and active solar strategies, as well as rainwater collection and greywater reuse systems. Visit the Ohio State Office of Energy and Environment website to learn more.